The original preservation of this land in the early 1960's was a joint effort led by Harvard’s Ernst Mayr, and then Middlesex Headmaster Monk Terry. The Woods were named after Thomas Estabrook, a Colonist who settled in this wild area in the 1680’s. His cellar holes are over 325 years old! Revolutionary War: Each Patriot's Day, the Carlisle minute men march down the old Estabrook Road reenacting the journey taken April 19th 1775 to the fight at North Bridge. That day was the start of the American Revolution. The Estabrook Woods contains the only remaining Minute Man road. Henry David Thoreau spent many days deep in the Estabrook Woods. Over the years his journal entries were littered with remarks and views of the area, calling the area the “Easterbrook county” and a “paradise for walkers.” Altogether, Thoreau wrote 160 journal entries and over 50,000 words on the Estabrook Woods. The Cellar Holes, which are from the 17th century, mark what is considered the deepest most isolated area of the entire woods. Henry Thoreau's best walking companion, the young poet Ellery Channing, immortalized this spot with the poem “The Lonely Road," written when living on nearby Punkatasset Hill. Endangered Species: Middlesex School's portion of the Estabrook Woods contains habitats for five state-listed species: A globally-endangered dragonfly and four Species of Special Concern: the Blue Spotted Salamander, the Elderberry Long horned Beetle, the Spotted Turtle, and the Mystic Valley Amphipod. The woods are also a breeding site of at least three watch list species: the Spotted Salamander, Northern Leopard Frog, and Northern Goshawk. Estabrook Woods is home to over 159 different species of bird, six species of thrush, four species of owl and ten of hawk. In 1993 The U.S Secretary of Agriculture Alphonso Michael Espy, honored the entire Estabrook Woods by formally designating it a Forest Legacy Area under an Act of Congress for its environmental values, the presence of rare and endangered species and archeological and historic resources. In October, 2001, The Massachusetts Office of Environmental Affairs designated the Estabrook Woods as 'core habitat' whose preservation is needed to protect biodiversity. Site Plan - View an an annotated site plan outlining the development. This development would extend 1500 feet into the Estabrook Woods from the current campus and would be only 10 ft. from the boundary of Harvard's ecology study area. The new access road will enable the more intensive development of 44 additional acres of upland in Estabrook Woods. To date, the access bridge and tennis courts have been built. 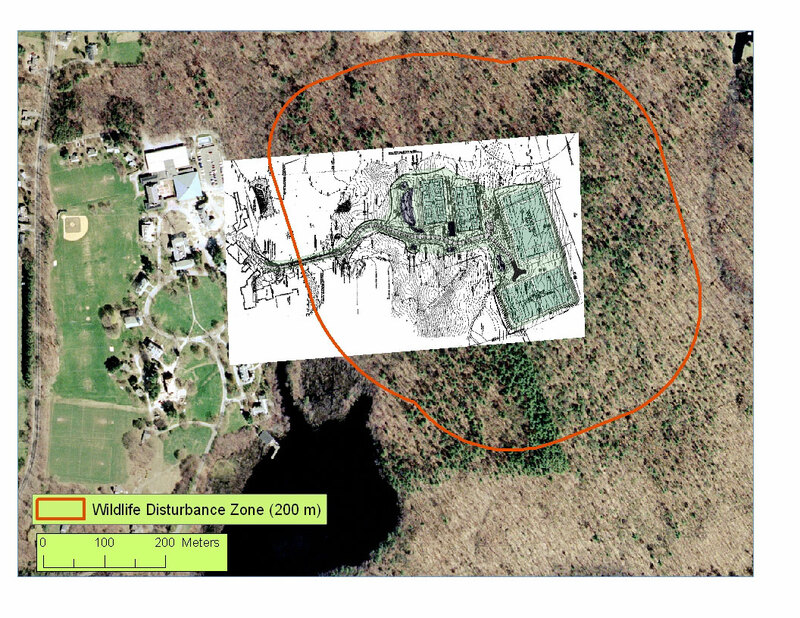 In the spring and summer construction season of 2007, Middlesex School plans to continue development of the soccer fields, clearing an additional 6 acres of forest and 1200 feet of grading. In 2003, a generous Middlesex parent offered to endow a state of the art environmental studies program if the school would agree to preserve its portion of the Estabrook Woods. The offer was backed by commitments of $5 million. The proposal included a jointly run Harvard/Middlesex environmental education program, and a fully endowed Middlesex chair for Environmental Studies. This offer was rejected by the Board of Trustees. The Concord Land Conservation Trust arranged for a Federal Forest commitment of $1.5 million to Middlesex School in return for conserving 44 acres immediately adjacent to the Harvard boundary within the Estabrook Woods. Once again the offer was rejected by the Board. 66% of those surveyed believe the current athletic facilities are sufficient. 86% view the Estabrook Woods as an important asset to Middlesex School. In the mid 1990’s, ten individuals, alumni and Concord residents filed a lawsuit against Middlesex School to stop them from building the bridge across the wetlands. Fifteen years later, Middlesex School won the lawsuit and began development in the Estabrook Woods.